I promised a day or two ago to explain my Buttered Biscuit Theory of Life. I often tell this story when I teach classes, particularly a class on Attracting a Partner. I see so many people who will tell you they WANT something. A partner, a job, an education, a house, a better life, whatever it is. The way they pursue it, though, is less than effective, bringing me to the BBToL. 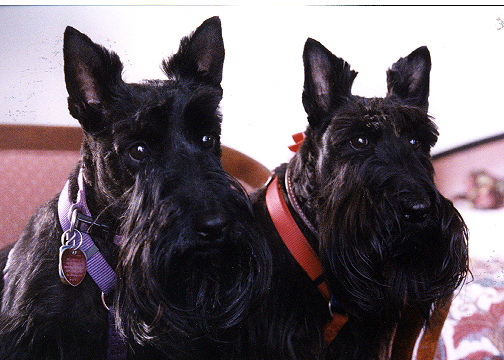 My first Scottie was Beamer. Beamer is in the red collar, Lulu in the purple. Beamer was a complicated dog. She wasn’t mean, she didn’t bite, she wasn’t destructive, she was actually pretty smart. We got her when she was eight weeks old, little strips of newspaper clinging to her little feet from the crate she’d been in for the drive. She didn’t much like strangers. Again, she didn’t bite, she just barked. The only person in the world whose lap she ever wanted to sit on, from her first day to her last, was “Uncle drew.” She ADORED Uncle drew. However, being the complicated little pup she was, she didn’t want anyone to KNOW she wanted to sit on his lap. That would make her a sissy or something. She could only, in good conscience, sit on drew’s lap if there was an overwhelming reason. So, when she wanted to sit on his lap, she would look at me, and wait for me to raise my arms in our traditional Puppy Monster pose. I would do this and chase her through the house or the yard, she would run, it was great fun. She would look at me until I did Puppy Monster, and then jump into drew’s lap because, clearly, she was being threatened. Except, by the time she neared the end of her life, we were both kind of past serious Puppy Monster pretend. She would look at me as I sat at my desk, I would half-heartedly raise my arms in a very lazy PM, and she would jump on his lap. But back to the BBToL. Beamer was sitting under my feet one dinner, as she often did, because she was no one’s fool. It happened I had made biscuits, and I split a biscuit and buttered it, and then the thing slipped out of my fingers and landed with a plop right on top of her little punkin head. What could I do? I mean, seriously? It landed on her head. I didn’t want it anymore. How mean would you have to be to take it away from her? So, she got the buttered biscuit, the whole half of the biscuit. With butter. I have always believed that colored Beamer’s view of life. We have trees in our yard that have squirrel nests in them. Big squirrel nests. I don’t know if you’re aware of this, but Scottish Terriers consider squirrels to be the anti-Christ. All squirrels everywhere on the planet, should be chased, caught, and torn limb from limb. None of my Scotties have ever done any more than the chasing part, by the way. Each of them has, over the years, closed their teeth on the air that only split seconds before was occupied by a squirrel, but they’ve never, thankfully, actually caught one. But what Beamer would do, after she chased a couple of squirrels and barked to announce this was her property, and squirrels were absolutely not welcome, was go out and sit under the tree where the nest was. She would sit there and occasionally look up, as if she expected a buttered squirrel would fall from the sky, right on her punkin head. Don’t you know people like that? They want those things, they really do, but their approach to gaining them is to wait for them to fall into their lap, out of the blue, like a buttered treat dropped from an abundant table above. I will say that the BBToL did work pretty well for Beamer. Once. She never had another buttered anything fall on her head, though she lived to a fairly ripe old Scottie age. So, if you want something, my suggestion is, work for it. Sit and wait for it to fall in your lap, and you’re likely to wait a very long time. And that’s the Buttered Biscuit Theory.